I am determined to make this week a great one and a productive one. I read that if you put your intentions out there, you are more likely to follow thru 🙂 We shall see. The cravings for vegetables continues. 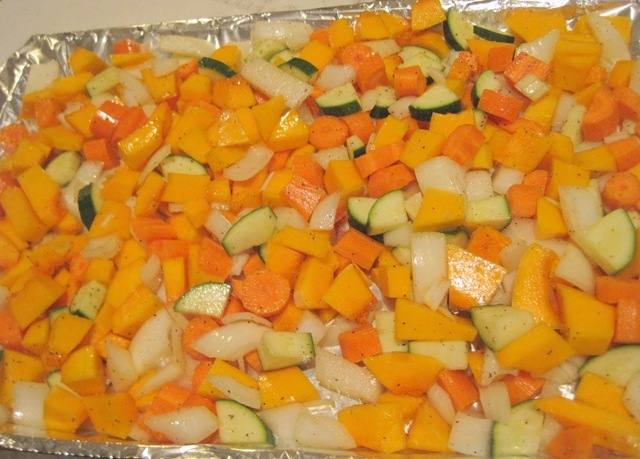 A whole lot of butternut squash, carrots, zucchinis and onions. These are tossed in olive oil, salt & pepper to taste and roasted at 375 degrees for 30 minutes. Saffron = which I believe is the most expensive spice in the world. A little goes a long way (I found there’s cheaper version of saffron sold at Trader Joe’s). Recipe adapted from The Kind Diet cookbook. The only thing I changed is the amount of vegetables and spices, I added more. For original recipe, see here. 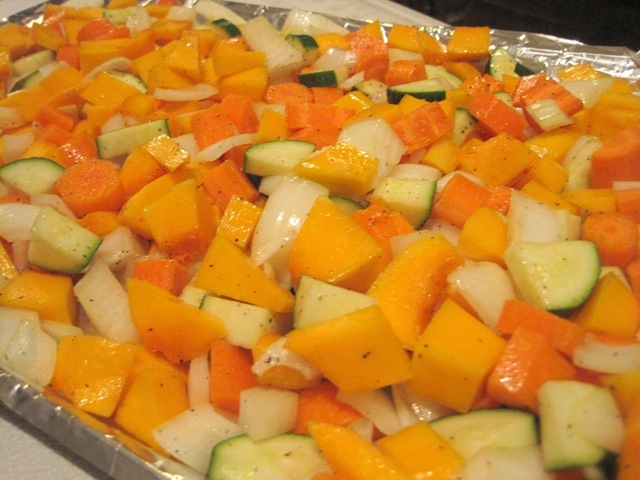 Place the squash, onion, carrots and zucchini on a baking sheet and toss with olive oil, 1 teaspoon salt, and 1 teaspoon pepper. Roast for 25 to 30 minutes, turning once with a spatula about midway through. While the vegetables roast, bring the vegetable broth to a boil in a saucepan. Remove the pan from the heat, and stir in the butter, remaining 1/2 teaspoon pepper, cumin, saffron and salt to taste. Cover the pan and steep for 15 minutes. 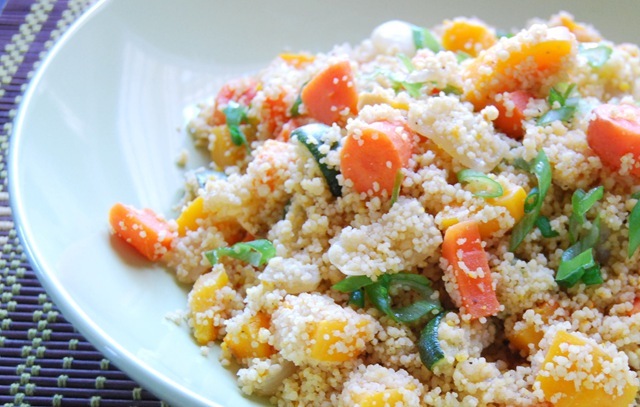 Scrape the roasted vegetables and their juices into a large bowl, and add the couscous. Bring the vegetable broth back to a boil, and pour over the couscous mixture all at once. Cover tightly with a plate and allow to stand for 15 minutes. I’ve made this dish several times. It’s vegan and it’s one of the vegetable dishes that is requested by the fiance. Christina, I love that the dish tasted good and LOOKS good. Sometimes it’s not always the case. Not a dumb question at all. I asked for help at Wholefoods myself. The organic saffron that I used can be found at the spice section at Wholefoods. 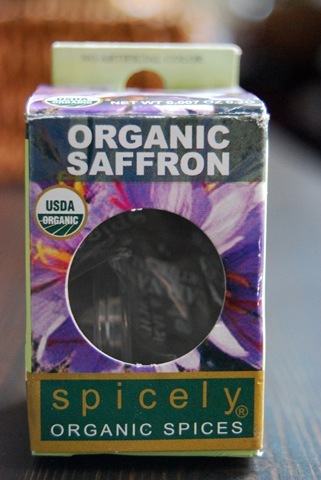 The picture of the organic saffron on the post is about $8 and I used it 2-3 times. 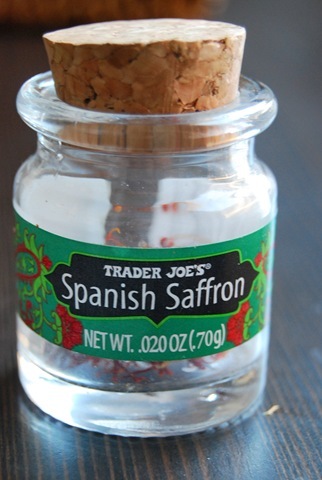 The spanish saffron from Trader Joe’s is about $4 for the small bottle. Lea this looks INCREDIBLE! 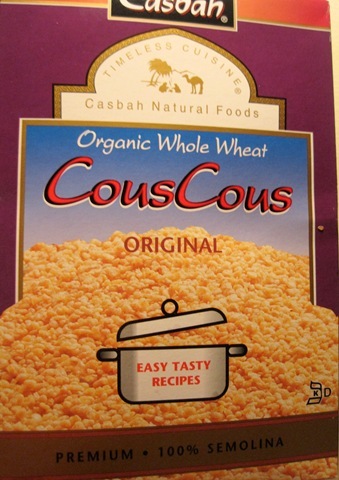 I love couscous and don’t eat it often enough. 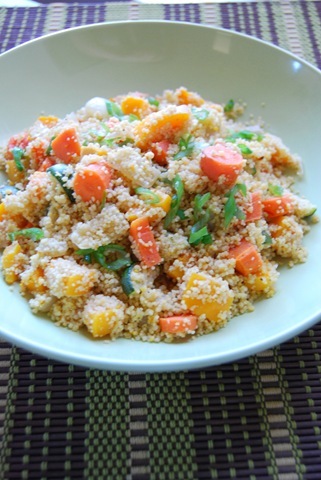 Janetha, I love that I can make couscous in a batch and have a variety of meals the whole week. Spabetty, this is the only dish that I used saffron in, I haven’t really ventured out with other dishes. 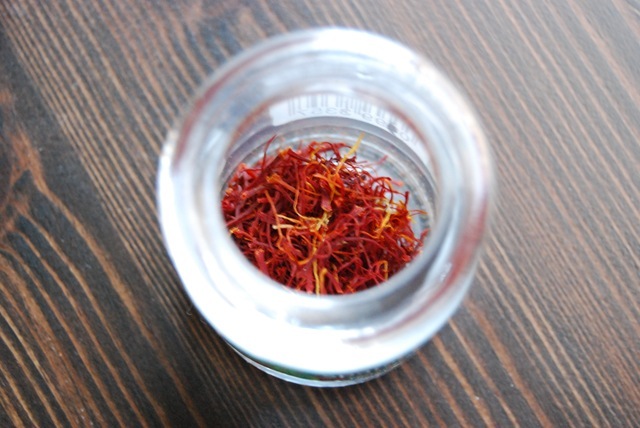 Do you have any favorite recipes that you use saffron in? Yum! This looks so good. I love Couscous right now and I want to try and cook with saffron more because I like the flavor. Very delicious! Wow your week is already look so good. I’m jealous of your meal holy moly. The color really pop in this dish which always makes eating more fun for me! Yum! I definitely eat with eyes and I love colors and textures in my food. It’s great when a dish taste good, but even better when it’s appetizing for the eyes too. 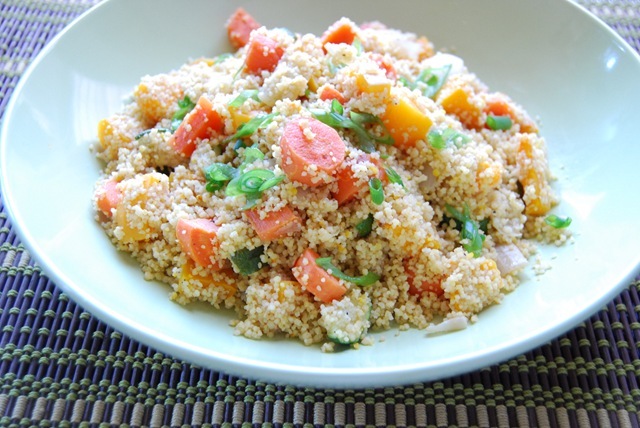 I LOVE couscous! This dish looks amazing! I love the blend of the colors. I definitely need to try making this. Mmm! I really need to cook more with couscous, I have a package at home but never use it.. thanks for the inspiration! 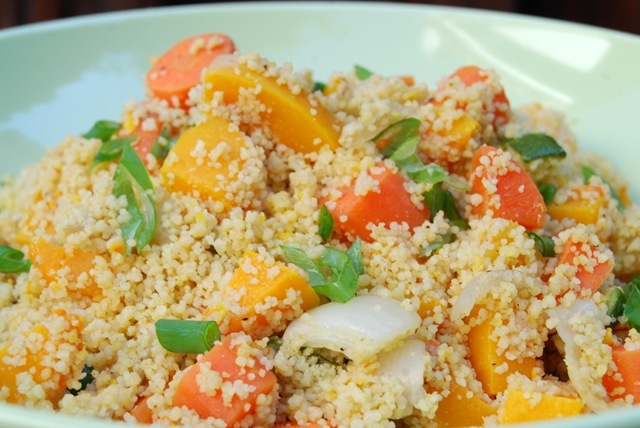 Anne, couscous is so versatile, you can cook with a lot of spices and also I’ve seen it cooked sweet. I make a batch all the time and just eat it throughout the week. i still have my little jar of saffron from TJ’s from last year?!? i don’t think i’ve used it ONCE! Lynn, this comment makes me think of your Foobuzz video when you said that you’ll use the little clear container for maybe saffron? so funny!